Bury manager David Flitcroft took pre-match mind games to a new level against the Cobblers by speaking about Nathan Cameron’s suspension in his pre-match interview and then selecting the ex-Town defender in his line-up. Flitcroft openly discussed the fact the centre-back had 10 bookings - and would miss two games - in his weekly press conference and even wrote about it in his programme notes. But Cameron played the full 90 minutes of the 2-1 victory and the Bury boss revealed afterwards it was part of a his strategy for the game to surprise his opposite number Chris Wilder. “It was a talking point - there was mistaken identity on one of his earlier bookings and we got clearance from the FA to make sure it wasn’t 10,” he said. 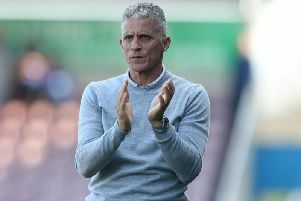 “I think it was a surprise to Chrissy Wilder when the teamsheets went in and I wanted to keep it under wraps because we’d put it out there and made a bit of a play of it. Flitcroft was vociferous in his celebrations of both his side’s equaliser and their late winner and rightly so as Bury are now only a point off automatic promotion as a result. But he was also stern in his criticism of the Gigg Lane supporters who booed his team off when they were 1-0 down at the half-time interval. “We got booed off at half-time and I think that’s a joke myself,” he said. “The players need supporting and there was a lot of moaning around. “There is a hell of a lot of work to be done at this football club and it’s quite incredible to hear that because there is a bigger picture. “If people want to moan, just stay at home and moan. I don’t believe you pay your money to moan, you pay it to support.